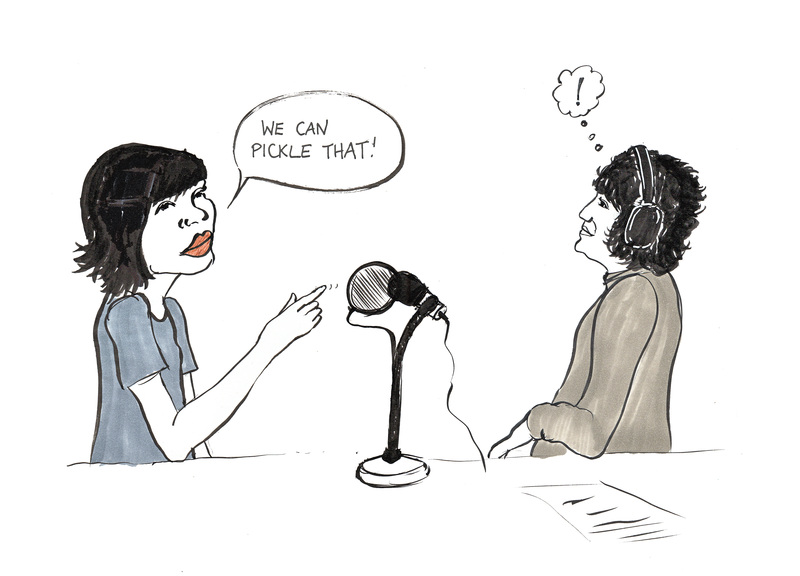 Carrie Brownstein and Jane Garvey discussing pickles (It’s a quote from Portlandia). I’m lucky enough to have been invited on to Woman’s Hour twice. The first time, in October 2015 I was interviewed by the lovely Jenni Murray about Becoming/Unbecoming. Jenni put me totally at ease, even though I was so nervous I thought I’d forgotten how to speak! The second time in November 2015, I drew along with the studio conversation. The drawings were then tweeted by BBC radio 4 crew. I had been asked to make drawings in response to a studio discussion about what people looked like as part of a feature called Mirror Mirror. However, on the day in question the section discussing what people look like was quite short, so I did my own thing. As you can see, some of it came out ok. I started by drawing the crew, (of course people don’t usually see them) and the crew liked them so much they took them home! This is Laura, the Runner, who does indeed run around everywhere all the time and turned out to be called Laura Gallop. A Galloping Runner. Fab. 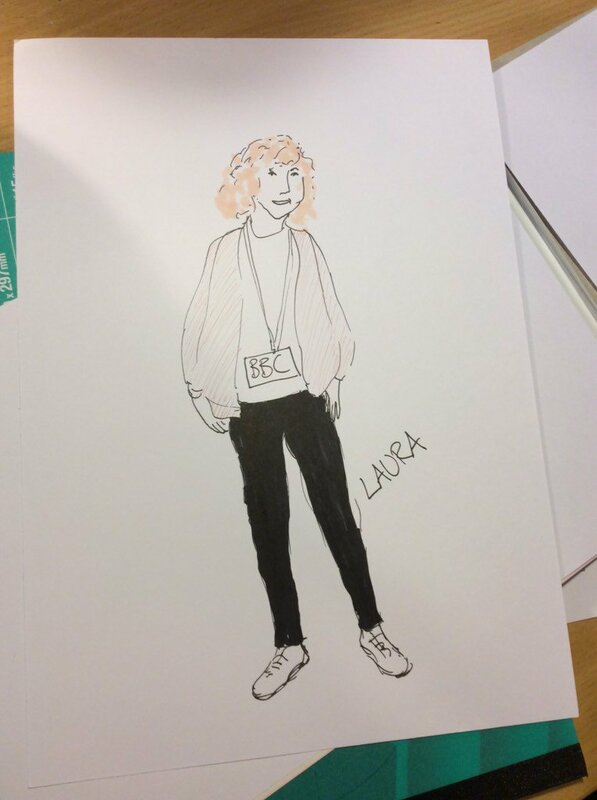 Laura took her drawing home with her so this is the image as tweeted live from the studio on the day. Not sure of the photographer’s name so can’t credit her. 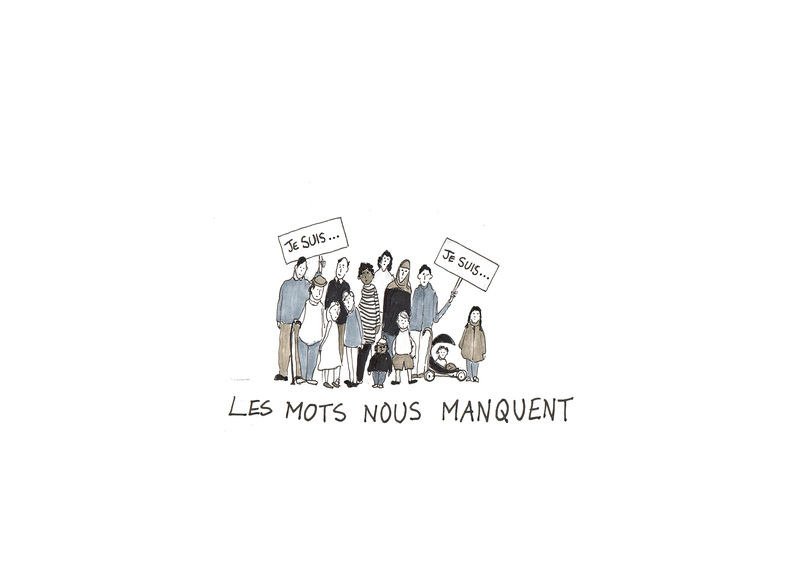 As the show went out shortly after the Paris attacks, there was a studio discussion around how parents might talk to children about these events. A serious and sensitive topic, and not an easy thing to make a cartoon about on the spot, but I did, and I’m rather proud of it. It’s in French. The words translate as ‘we’re lost for words’. It is quite inhibiting trying to draw while there is a camera over your shoulder and someone hovering with an iPad, so some of the drawing from that day is pretty wonky, but they liked it, that’s the thing. 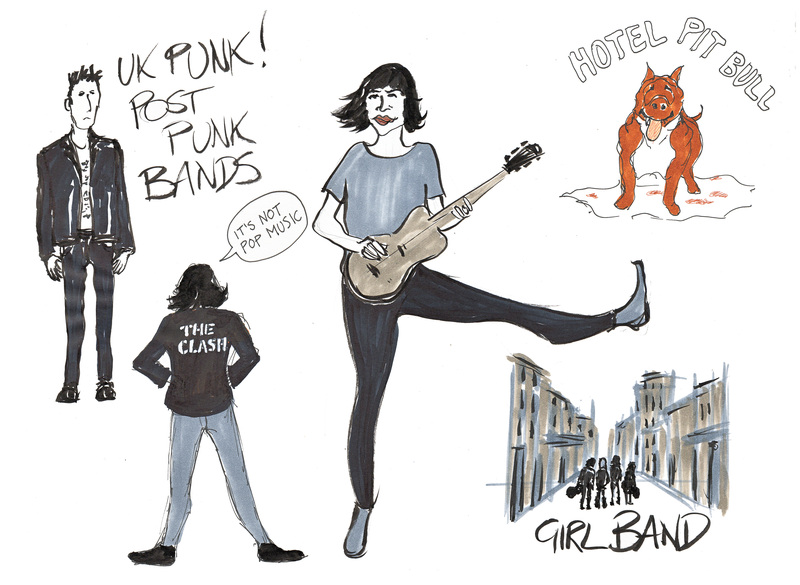 I managed to draw Carrie Brownstein of Sleater-Kinney and Portlandia fame while listening to the recording and without so many spectators, so it came out pretty well I think. She was talking about her musical origins, about having a love for UK punk and post punk bands like The Clash and about staying overnight at random peoples houses, when they were too poor for a hotel. One overnight stay featured a pit bull on heat!